The wife of Jerry Cruncher (and mother of Young Jerry), Mrs. Cruncher's regular praying constantly upsets Cruncher, who feels that it interferes with his work. Though in fact her praying interferes only in the sense that it forces Cruncher to face the guilt he feels at his job robbing graves. By the end of the novel, Cruncher has himself given up his job and taken up his wife's practice of praying regularly. The timeline below shows where the character Mrs. Cruncher appears in A Tale of Two Cities. The colored dots and icons indicate which themes are associated with that appearance. Fyfe, Paul. "A Tale of Two Cities Characters: Mrs. Cruncher." LitCharts. LitCharts LLC, 22 Jul 2013. Web. 11 Jan 2019. Fyfe, Paul. 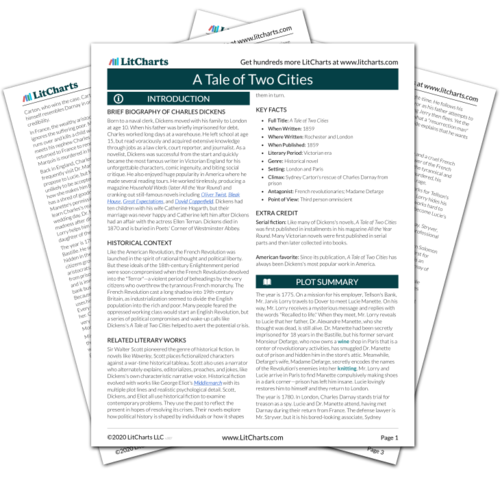 "A Tale of Two Cities Characters: Mrs. Cruncher." LitCharts LLC, July 22, 2013. 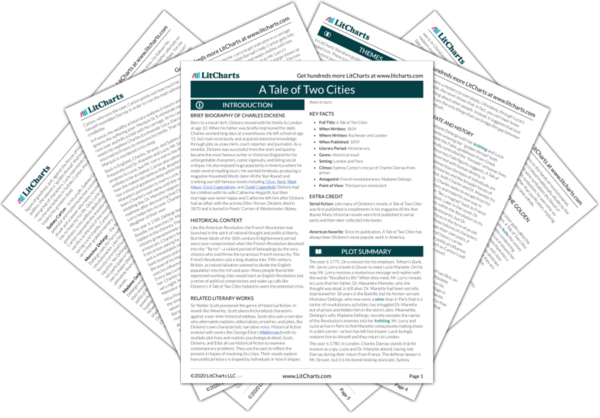 Retrieved January 11, 2019. https://www.litcharts.com/lit/a-tale-of-two-cities/characters/mrs-cruncher.